Not surpringly, I started out my Turkey Day with exercise. 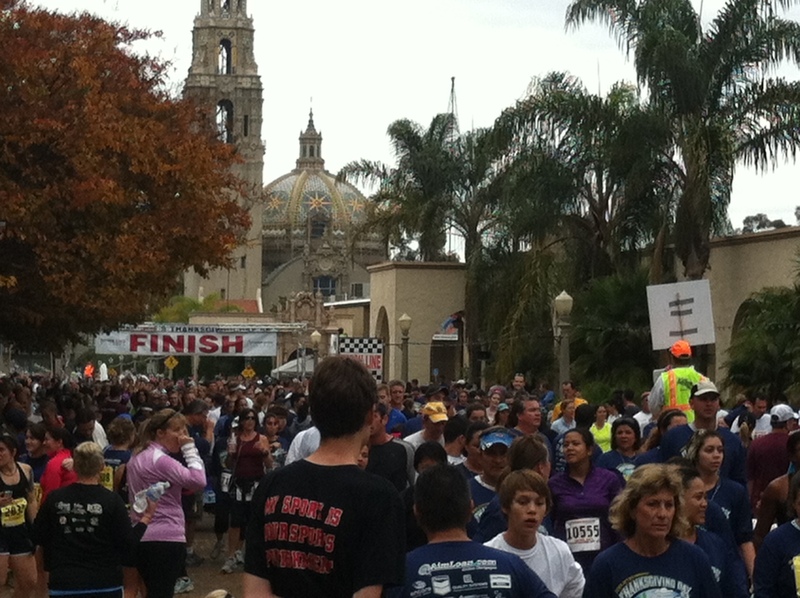 Mike and I participated in the Father Joe’s Thanksgiving 5k which took place in Balboa Park. 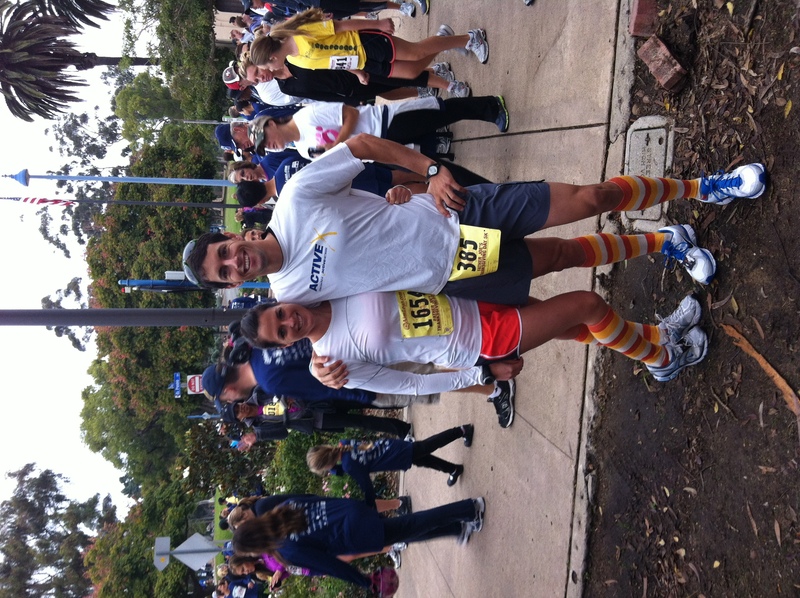 We ran the race with a few of his coworkers and in the spirit of the holiday, we purchased festive turkey inspired socks to wear during the race. 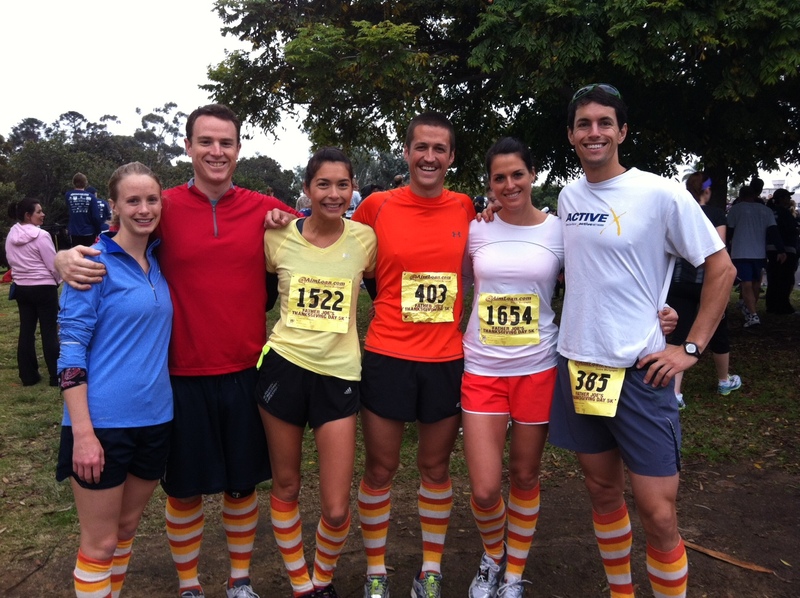 I treated this race as a “fun run” and it definitely was! Despite knowing that I’d be running this race on tired, unrested legs, I knew that it would be a big PR for me. I decided to aim for time under 23 minutes for this race, since my 5k at the end of the Solana Beach Triathlon was 23:30. 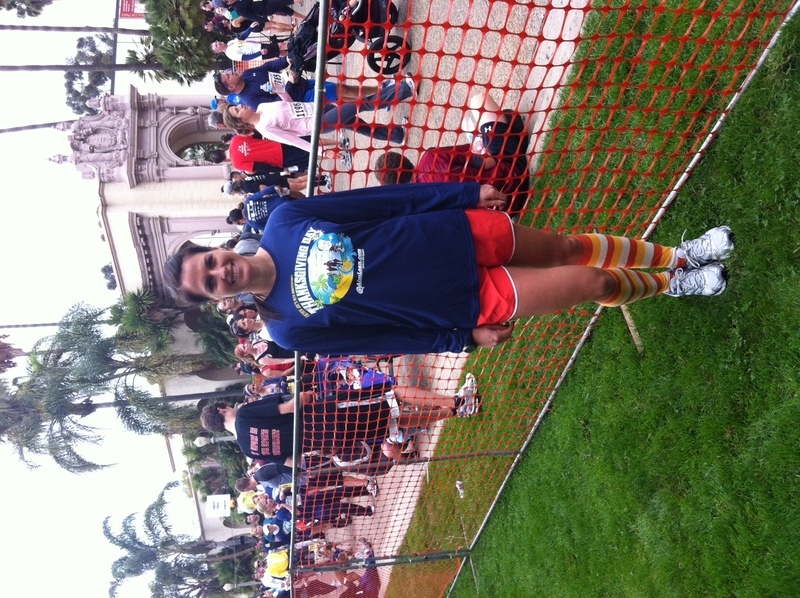 I didn’t really have a race strategy – just run hard. The race itself was well organized. We arrived at the start like about 10 minutes ahead of the gun and made our way to near the front of the designated “runner” section. A large majority of participants in the Father Joe’s Thanksgiving Run walk or walk/run the race, so they have designated two start groups. The race is chip timed but if you were to start with the walkers, it’d be hard to run around all of them to get up to the front. Despite finding a good place near the front, the beginning was slow moving. It was hard to dodge people and I got body checked by a big dude who was in a hurry to get around me. 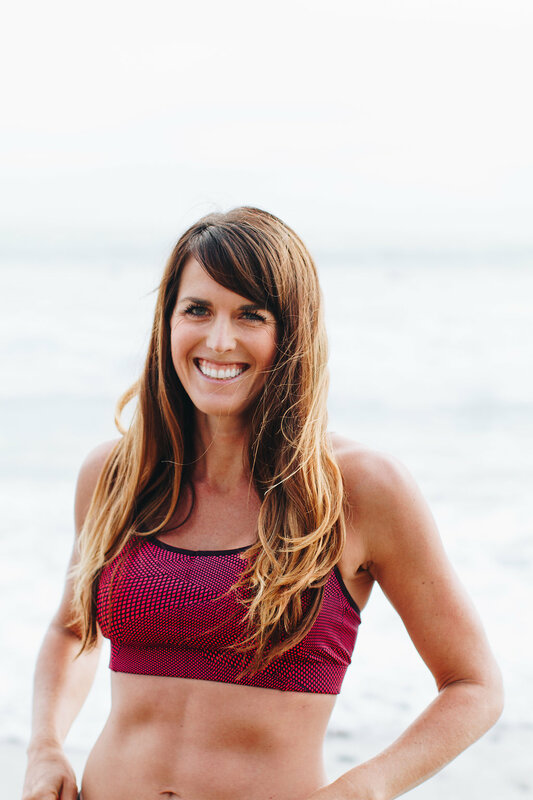 The course was pretty hilly – it was pretty much either uphill or downhill the entire time so I tried to use the downhills to my advantage and keep a good pace going uphill. My Garmin let me know that I ran the first mile at a 7:30 pace, which was a little slower than I had hoped, considering it was mostly downhill. At about mile 2 I ran past a 10 year old girl who had been keeping a pretty good clip. I also clocked Mile 2 at just over 8 min/mile, which was definitely not as fast as I had hoped. My legs just didn’t want to move faster! I could feel the heaviness in my legs left from several days without rest, including three days of Insanity, a long bike ride, a 13 mile run and a interval run workout. I picked it up for the last mile, finishing it at about 7:20. I knew that I hadn’t achieved my goal of sub-23, but I was proud of myself to running a 5k under 24 minutes. Last year when I trained for my 2nd half marathon, I remember setting the goal of a sub 8 min/mile for a 5k. I achieved that goal with a final time of 23:55, a 7:43 pace. I came in 19th in my age group out of 258. The best part of the day was knowing that a part of my registration fee was going to help feed the hungry. Father Joe’s is a great organization and one that I have been involved with in the past. They feed the homeless 364 days a year – every day except Thanksgiving, due to the fact that all the other not for profits decide to feed them that day. 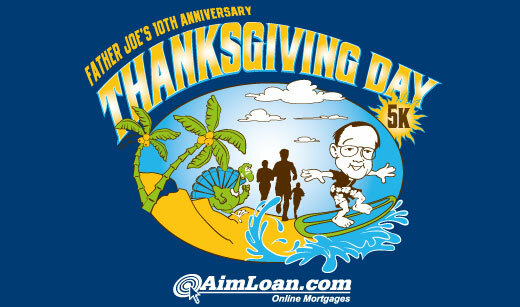 The only day that they aren’t serving food, they are raising money by organizing a time-consuming 5k. I hope that I will have more opportunities to help this organization in the future. As for the sub 23….I’ll blow it out of the water next year!